The trek to Annapurna Sanctuary in the mountains above Pokhara is 64 miles long and takes from six to 10 days. During the summer, it's one of the easiest and most scenic hikes in Nepal and you can sleep in and eat at tea houses every night. We hiked it in the depths of winter so you don't have to. Nepal has two major cities: Kathmandu, the capital, and Pokhara. Kathmandu can be best described as a madhouse. Motorcycles carrying entire families of four dodge in and out of traffic on every street. In Thamel, the tourist area most popular with trekkers, vendors are constantly pushing products and services. While walking around, I get about twenty-thousand whispers of Hash? in my ear per day. Must be the beard. Venture outside of Thamel into the heart of the city and it's even crazier. People walk through streets made of mud; motorcycles ride on the "sidewalks" while workers lay pipe in between. Pokhara by comparison, is much more relaxing. Most westerners hang out on a stretch of road lined with shops, restaurants, and hotels alongside Phewa Lake. If you look up from almost any point in the city though, you can see the Annapurna range towering overhead. 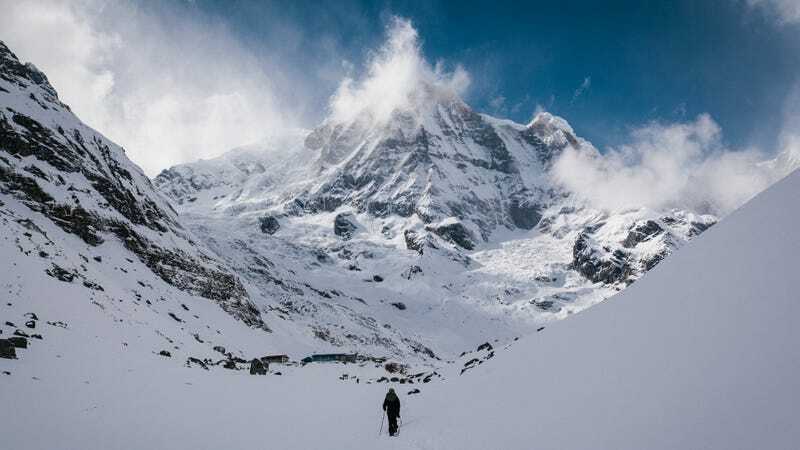 Given the Annapurna Sanctuary's stunning beauty, it's proximity to Pokhara (the trailhead is only an hour's drive away), and the short-length of the trek, it's no wonder why the trip to Annapurna Base Camp (ABC) is one of Nepal's most popular. While I love nature, I'm not a fan of dealing with crowds in nature. And I figured that by embarking on this journey in the dead of winter, I wouldn't see any. I was right. Mountains. Big, beautiful ones. Mount Machhapuchchhre can be seen for most of the trek. Once hikers arrive at Machhapuchhre Base Camp (MBC), they turn and head up the valley to ABC while Annapurna South towers overhead. This trek is also incredibly accessible compared to many others in Nepal. A one-hour taxi ride or a one and a half hour-long bus ride from Pokhara will get you to the trailhead at Nayapul. To get into the Everest region by comparison, you've gotta A) fly into the deadliest airport in the world, in Lukla B) take a nine-hour vomit-inducing bus ride from Kathmandu to Jiri, before hiking another 60 miles just to reach the "start" at Lukla or C) take a 15 hour-long jeep-ride from hell. The ABC trek is also relatively quick, which is great if you're short on time. It's normally done in 8-10 days. I did it in six. Day 1: Alarm went off at 5:30am. Packed my things. Well, almost all my things. I forgot my rain shell at the Turkish restaurant next door, the night before. They wouldn't be open till 9am. Guess I was getting a late start. By 9:05, I was on the road — Outdoor Research Helium II in-hand. An hour later, the cab driver dropped me off at a roadside restaurant in Nayapul, where my journey would begin. I had left my trekking poles along with the rest of my climbing gear at Trekker's Home in Kathmandu, but the restaurant's owner had a bunch of freshly-cut bamboo walking sticks for sale. Fifty rupees ($0.50) got me exactly what I wanted. Time to hit the trail. The day was relatively quiet and uneventful, but beautiful nonetheless. Temperatures were surprisingly warm for winter (in the sun, I was actually hot wearing just a synthetic t-shirt top and softshell pants), but once I started gaining elevation, some clouds rolled in and it cooled down. I stopped for the night at 4:30 — just before the village of New Bridge — after hiking 12 miles. A big dinner of egg fried noodles, potatoes, and milk tea relinquished my hunger. With no other trekkers to entertain my company (and the lodge owner was busy in the kitchen) I was asleep by 6:30. The Vasque Grand Traverse stood up to their name and took me through nearly every type of terrain on this trek: dirt, mud, snow, and ice. Day 2: Up at seven. Ate a breakfast of muesli with hot milk — a trekker's staple. Hit the trail by eight. The first section was relatively flat before dropping down to a river crossing. What goes down, must go up, however. The climb to Jhinu was steep. The steepness continued to Chomrong, the last village I'd see in this region (there were only trekking lodges ahead). Along the way I met a Chinese couple, Eric and Lei; and Taiwanese twins, Erina and Stam. The five of us hit it off pretty quickly; we hiked together for a few more hours until reaching Sinuwa, our stop for the night. We traded stories and photos of our adventures until the lull of sleep called us to bed. Day 3: Up at seven. Muesli with milk. Hit the trail by eight. Clockwork. From Sinuwa, we continued to steadily climb. Up. Up. Up. Past Bamboo. Past Dovan. By the time we reached Himalaya, we hit a dense fog. Without going much further, that fog had changed to precipitation in the form of snow. I was the first of our loosely-assembled group to reach Durali (which means "Pass" in Nepali,) at 10,200'. Visibility was low by the time I stopped; a layer of fresh powder had begun to coat every surface that wasn't already white. There was only one lodge open; it was full of people heading up. Though it seemed I had finally caught a crowd, everyone else was there for the same reasons as me: to escape the crowds while trekking to ABC. The food was delicious, the conversation was lively, and the presence of so much body heat cut the chill from the cold. Energy buzzed through the air. A group of trekkers had just returned from an "attempt" on ABC. "Conditions were bad," they said. Turned around, they had. "You'll never make it up." With Gore-Tex jackets, knee-high gaiters, and trail crampons - they were much better-equipped than me. In an effort to travel light, I had only packed the essentials: two down jackets, a lightweight shell, a down hat, warm gloves, base layers, and the softshell pants and lightweight hiking shoes that I was wearing. "I'll take my chances," I thought. In the morning. Day 4: A blanket of fresh snow covered everything in sight — several inches had fallen throughout the night. "Now it's time for an adventure," I thought. My plan was to head up to the next checkpoint, MBC, before continuing on to ABC, and making it back down to MBC for the night. With a plan, the excitement of snow, and my bamboo walking stick, I was off. The valley was beautiful in its own right, but fresh snow adds a certain degree of magic to every environment. Rays of light danced through the passing clouds. Gentle wisps of wind blew snowflakes all around, while tree branches cracked under their newfound weight. A chalky, turquoise-colored brook babbled over rocks and under ice. It was paradise. I was the first one of my group to reach MBC. A lodge at the top of the hill offered a place to sit; hot milk tea to drink. I secured a room for the night, and dumped a couple of non-essentials for the next segment to ABC. My new friends made it up shortly after and did the same. Before long we were back on the trail with Annapurna South; and our goal of ABC in sight. I have a theory. The more snow there is, the more beautiful the mountains become. As we approached ABC, wispy clouds danced around Annapurna South's summit, gracing her with a cotton crown. The snow was deep; while light tracks had already been established we were still postholing our legs through the deep snow. Gaiters would've been nice, but my pack was light. We marched on. Within a couple hours, we had made it. There are a few dedicated lodges at ABC; even in the dead of winter, they were still operational. Hot tea and snacks all around. We explored the area a bit longer and took pictures before heading down. The further we went, the less we could see. Clouds had rolled in; snow began to fall. There wasn't much room for diversion though, as the tracks were cut deep, so we just followed the valley down. More hot tea and a heater was waiting at MBC. Day 5: The night before, Bishnu, Eric and Lei's guide, had told us all about some hot springs in Jhinu, the same village I had passed through a few days before. They were gonna try and make it there that day. I agreed. Hot springs sounded incredible. I was a man on a mission; I blazed the trail as such. By blazed, I mean slipped, slided, and finally gave up and glissaded all the way back to Deurali. Going uphill in the snow without crampons is manageable. Downhill on the other hand, is a whole 'nother story. Dry ground didn't reveal itself in Durali though. Or in Himalaya. Or Dovan. Or Bamboo. The snow had reached all the way down to 8,000'. That low though, it was warm. As such, snow in trees became rain; dirt became mud. More sliding. I finally rounded a corner and boom. There was the sun. And dry earth. I was in a completely different world than I had been an hour before. I continued past Sinuwa. Up a thousand steps to Chomrong. Down a thousand more back to Jhinu; before sunset nonetheless. Fifty rupees (that went to support the local youth) and 20 minutes later, I was soaking in hot, glorious springs. Well-worth the knee-busting 13 mile-long hike. Afterwards I had dinner and hung out with some of the coolest Nepali dudes you'll ever meet. They were all from Lumbini, better-known-as the birthplace of Buddha. And they were trekking. For fun. Until that point, I had not met any Nepalis who trekked for fun. We hit it off real quick. After dinner, they went down to the hotsprings and I went down to sleep. Day 6: I took my time getting up and on the trail. I'd be back in Pokhara that night, anyway. The hiking was all easy; any time that I took that morning was made up for by the afternoon. At 2pm I popped up on the side of a highway. A local bus was immediately passing by and stopped. "Pokhara?" "Yep." "Jump on." Two-hundred fifty rupees and an hour and a half later, I was back at Lakeside. I was able to cram everything I needed (and some things I didn't) into the Cotopaxi Volta 35L. It was cold. Dress appropriately. Since food and shelter (in the form of tea houses) are provided along the way, you could easily get away with a sub-50L pack. I fit all of my clothes, gear, and snacks into the Cotopaxi Volta 35L. It probably weighed about 20 pounds, but only because I had to carry my computer, hard drives, and camera gear. That being said, there is absolutely no reason that you should have to hire a trekking porter for this trek (or any teahouse trek for that matter.) I can't count the number of porters I saw carrying multiple 120L duffels up the mountain. They weren't porting for climbers. They were porting for trekkers. Learn to pack. /End rant. Gaiters and microspikes would have been helpful, but I managed to get by okay without them. I carried the Mountain Hardwear Mtn. Speed 32 sleeping bag. At MBC, temperatures in my room got down to 23° F, but I slept in base layers and a down jacket and stayed warm. Trekking poles will help you hike, but if you don't have any, pick up a bamboo walking stick from the guy in Nayapul. I rather enjoyed hiking with bamboo. Take the local bus from Pokhara to Nayapul. It'll take an hour and a half and will cost 250 rupees. You could also hire a jeep, or private car, which will be 30 minutes faster, but it will also be much more expensive. What Should You Do While You Are There? 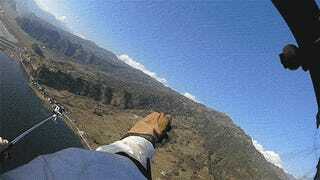 While you're in Pokhara, go Parahawking. It's awesome. Our friends at Klook offer the best prices and easy online booking on that adventure and more. What We'd Do Differently: I definitely would have brought some gaiters. Though my climbing crampons would've been overkill, they probably would have helped. About the Author: Chris Brinlee Jr. is an adventurer and storyteller who is currently traveling around the world. Follow his journey on Instagram: @chrisbrinleejr.